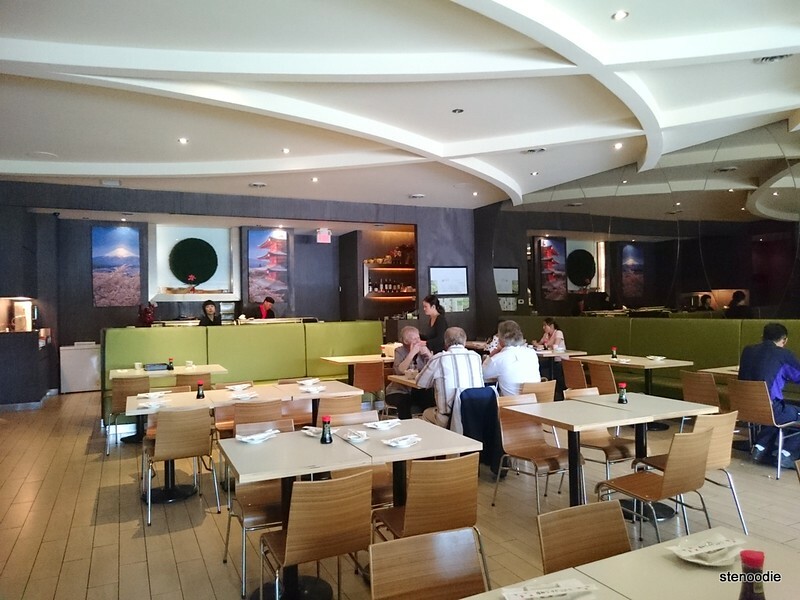 Earlier this week, Nicole and I had lunch at Kenkou Sushi Bar (their website seems to be down..), a sushi restaurant she’s frequented many times before since it is close to her residence. 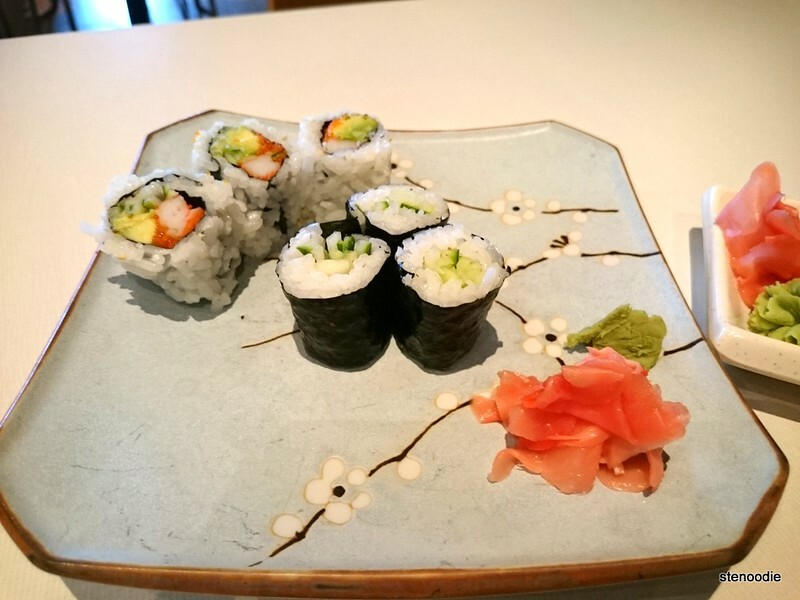 I was happy to try a new restaurant again and it never hurts that it’s sushi! 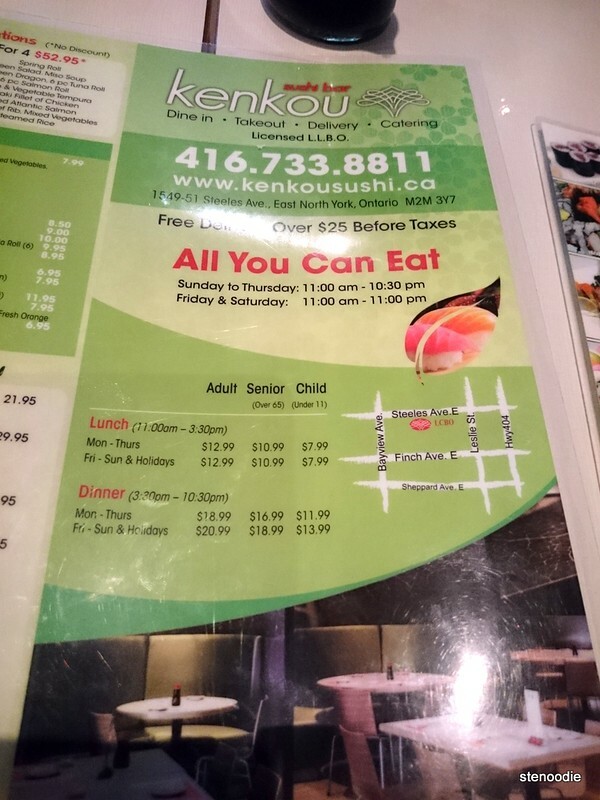 Kenkou Sushi Bar is located at a strip plaza where there is a gas station on Steeles and Laureleaf in North York. 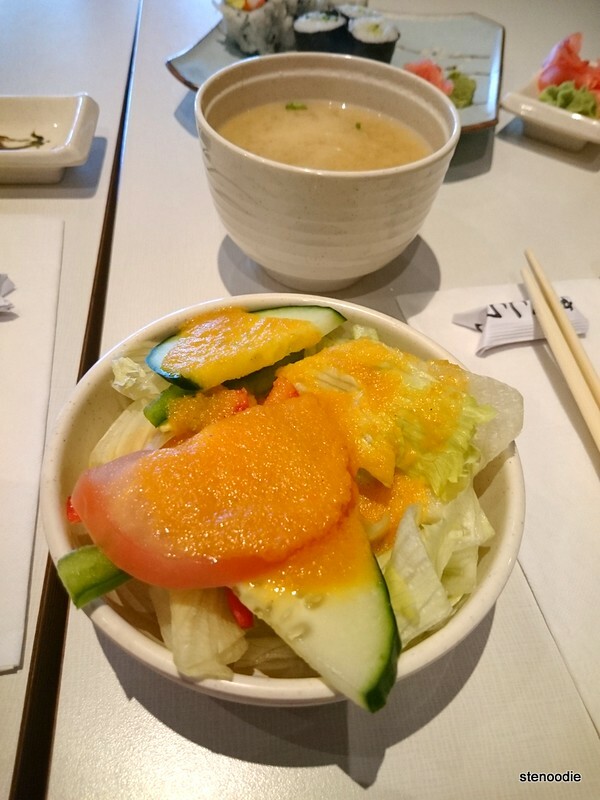 It is a very simple, no frills, and basic Japanese restaurant. The most popular item is the all-you-can-eat combo at lunch or dinner since it is only $12.99 for one person to order any item off the list. It’s a very affordable price! With this price though, you have to expect that the sushi and Japanese fare has lower expectations, which is what I expected for this restaurant. 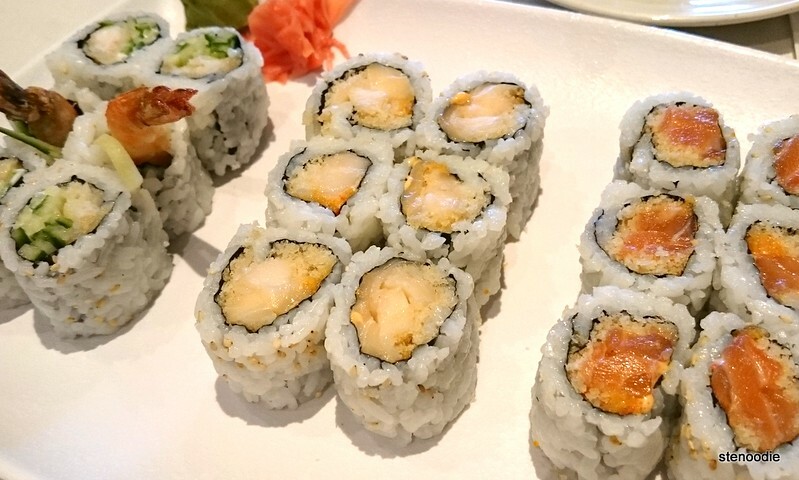 All you can eat is only $12.99 during weekday lunch! I love sushi rolls so I tried their L2 Roll Set of 3 rolls. They have a pre-selected list of rolls that you can choose from. 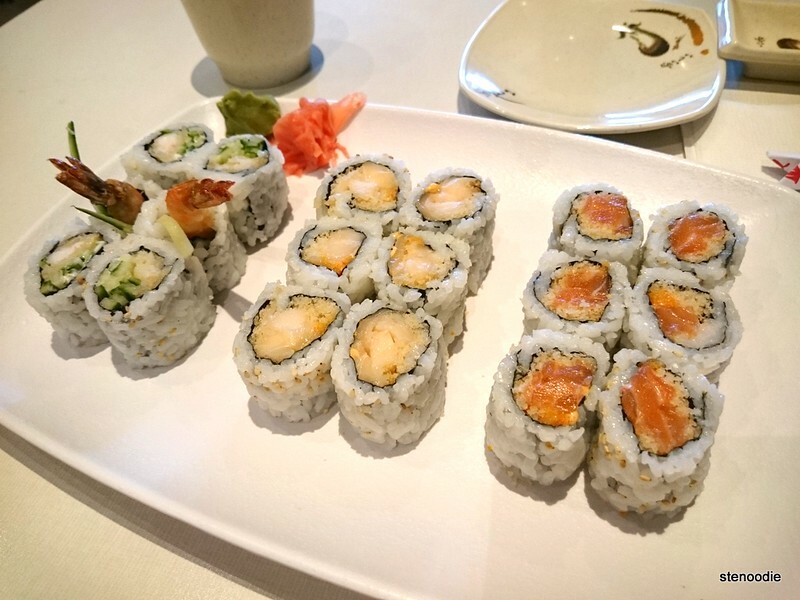 I chose my favourites: spicy salmon roll, shrimp tempura, and the spicy white tuna (I usually don’t get this one). I actually wanted to get the combo where it included a miso soup and green salad with the lunch combo, but the lady who took my order mistook that I only wanted the three rolls (it is a $1 more to get the soup and salad). When I asked about it, another server told me that if I wanted the soup and salad, it would cost $1.50, which I didn’t think was worth it. 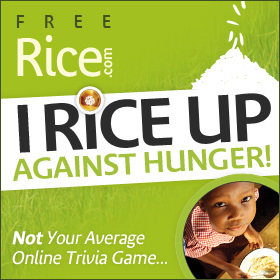 However, when I look back at the menu now, it says only $1’s difference. Hmm. So what’s up with that? Anyway, the three sushi rolls arrived relatively quickly and they don’t look all that great. There are minimal presentation points given to this place. 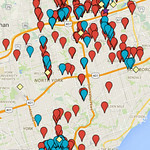 Again, you have to think that it is a very local and no frills restaurant. They cater to the people that live around the area and it is not specifically a place that you travel far for to eat sushi at. That is my impression of the restaurant. Nicole ordered the L1 Bento Box which included an miso soup, green salad, steamed rice, 2 spring rolls, stir-fried mixed mixed vegetables, 3 California rolls, and 3 cucumber rolls with a choice of meat — Nicole chose the salmon teriyaki (some of the choices include chicken teriyaki, beef teriyaki, beef ribs, vegetable/shrimp tempura, and pork or chicken katsu). (If I was ordering, I would have loved to try the beef ribs or katsu. Mmm!). The Bento Box looked great and there was so much food for just $7.99. It was definitely the better deal to go with, but I really wanted to try their sushi since it was my first visit. If I ever visit again, I may try their Bento Box just to get the beef ribs and katsu. 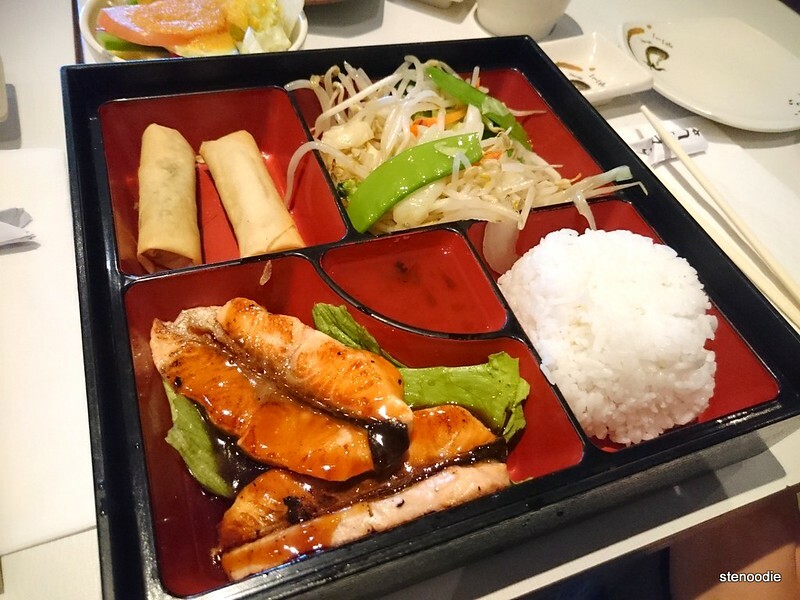 🙂 I tried a bite of the salmon teriyaki and absolutely loved the teriyaki sauce. It was perfect! If I come back to this restaurant for more food, I’ll try to post what I ate and see if my opinion of this place changes. So far, I think it’s a great sushi place for locals to have Japanese food and especially if they don’t care for high-quality sushi. 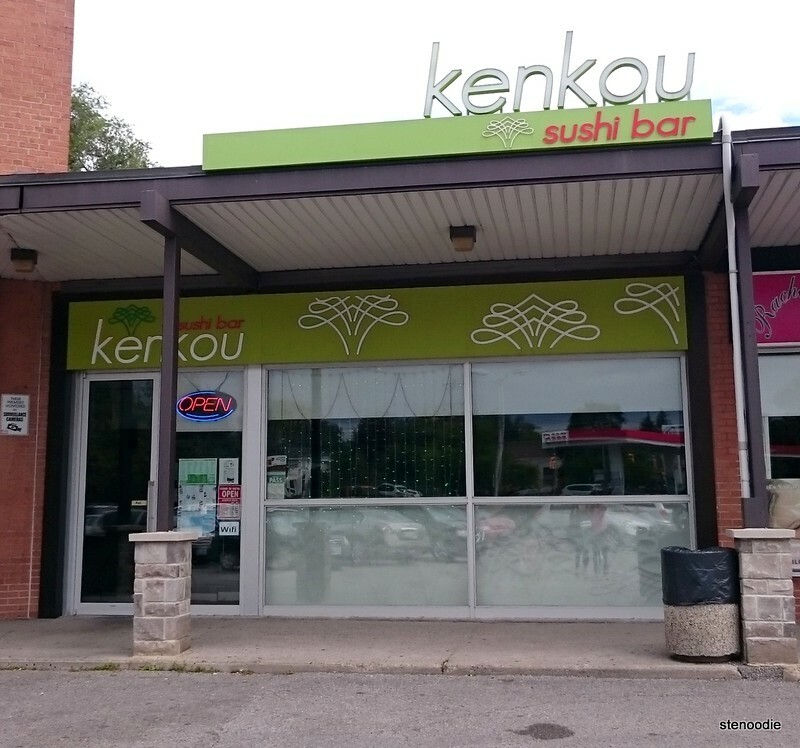 This entry was posted in Food and tagged 1549 Steeles Avenue West, all you can eat sushi at Kenkou Sushi Bar, all you can eat sushi on Steeles Avenue, bento box, food blog, foodie, Japanese, Kenkou Sushi Bar, Laureleaf, lunch, lunch set, North York, restaurant review, salmon teriyaki, shrimp tempura roll, spicy salmon roll, spicy tuna roll, Steeles Ave, stir-fried mixed mixed vegetables, sushi, Toronto. Bookmark the permalink.